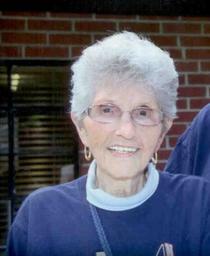 Arlie Mae Nichols Ramey, 88, of Athalia, Ohio passed away peacefully Thursday, February 7, 2019 at home surrounded by family. She was born July 24, 1930 in Miller, Ohio daughter of the late Janie Dillon Nichols and Grover Nichols. In addition to her parents, she was preceded in death by her loving husband of 65 years, Glen Ramey; her brothers William (Norma), Earl (Virginia), Russell, Marlin (Raylene), Bobby, Virgil, Junior and Ernie Lee Nichols; and sisters Alice (Donald) Jack and Janice Simms. She is survived by her youngest sister Juanita (Kenny) Dillon; sisters-in-law Twila, Mary Alice and Marie Nichols; her children Roger (Rachel) Ramey and Terry Chapman; beloved grandsons Ryan Ramey and his mother Robin, and Jason Chapman; and a very special great great niece Dylan Kerns. Arlie Mae retired from J.C. Penney, Athalia City Clerk, as well as being Trustee and Treasurer of Miller Cemetery. She was a faithful member of Federal Creek Church where she served in many ways and was a living testimony of God’s love. She was also a member of Proctorville V.F.W. Post 6878 Auxiliary. Another one of her passions was collecting and selling antiques and collectibles at the Proctorville Flea Market, where she and Glen made lifelong friends. She was the ROCK of the family – brothers, sisters, nieces and nephews would often seek guidance and solace from her. When her nieces and nephews called her “Aunt Doogie,” she always felt very special and loved. Thank you for so many wonderful memories. Funeral service will be conducted 2 p.m. Monday, February 11, 2019 at Hall Funeral Home and Crematory, Proctorville, Ohio with Pastor Jerry Galloway and Pastor Charles Meredith Turley officiating. Entombment will follow in Miller Memorial Gardens, Miller, Ohio. Visitation will be held 1 to 2 p.m. Monday, February 11, 2019 at the funeral home. In lieu of flowers, memorial donations to either the Federal Creek Church or Old Miller Cemetery, 20 Township Road 1284 Crown City, Ohio 45623 would be appreciated. Condolences may be expressed to the family at www.ehallfuneralhome.com. Please feel free to post a message of condolence. your email may enhance your chance of being spammed. Messages will be reviewed prior to display. Please allow 24 business hours for review. There are currently 1 condolences.